* Relay consists of 4 members. ** Family : Immediate family members only (minor age siblings, parents and grand parents). Family consists of min 3 and max 6 members. Day of event between 8:30am and 9:30am at event site (Stony Mountain Community Centre). Race Day registration also accepted up to 9:30am. Deprez & Associates PWM - What the Hill 5K Race : Saturday September 22, 2018 @ 10:10 A.M.
Sunova Stony Scamper Fun Walk/Run : Saturday September 22, 2018 @ 10:10 A.M. 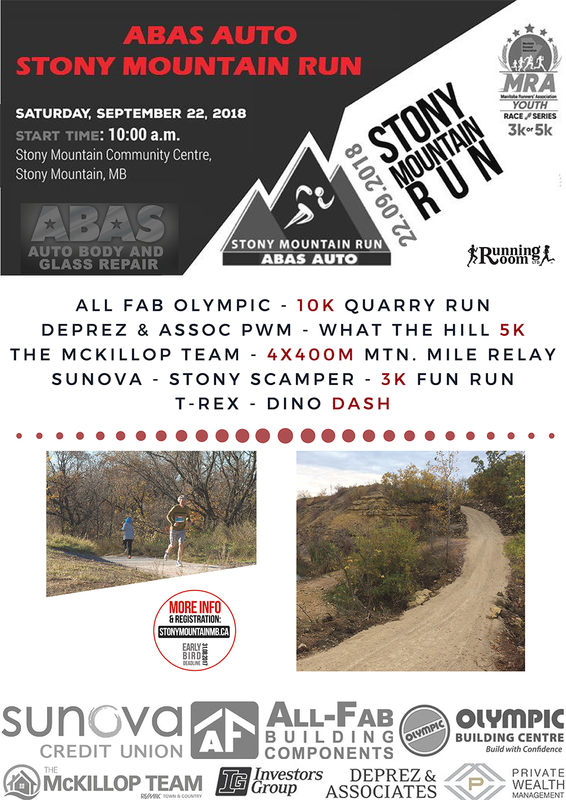 The McKillop Team Mountain Mile Relay : Saturday September 22, 2018 @ 9:45 A.M.
All-Fab Olympic 10K Quarry Race : Saturday September 22, 2018 @ 10:00 A.M.
Sunova Stony Scamper FAMILY RATE : Saturday September 22, 2018 @ 10:10 A.M.